Whether you are a busy career woman or a stay-at-home mother, you always rush out of the door with your trusty handbag that contains things that you might need while you are out but what I want to know is whether you have hand wipes in it? While I don’t think we need to wipe our hands furiously many times a day, it certainly helps to keep your hands clean before your touch food or get ready to feed your kids while out and about in the city or on your travels ( a bathroom might not be available to go and wash your hands ), so how do you serve this dilemma ? Can I suggest popping a few Mendill wipes in your bag before you close your front door behind you. The word ‘Mendil’ means tissue in Turkish, where the brand originates. Mendill’s focus stems from desire to form an inspiring organisation with sustainability at its heart. 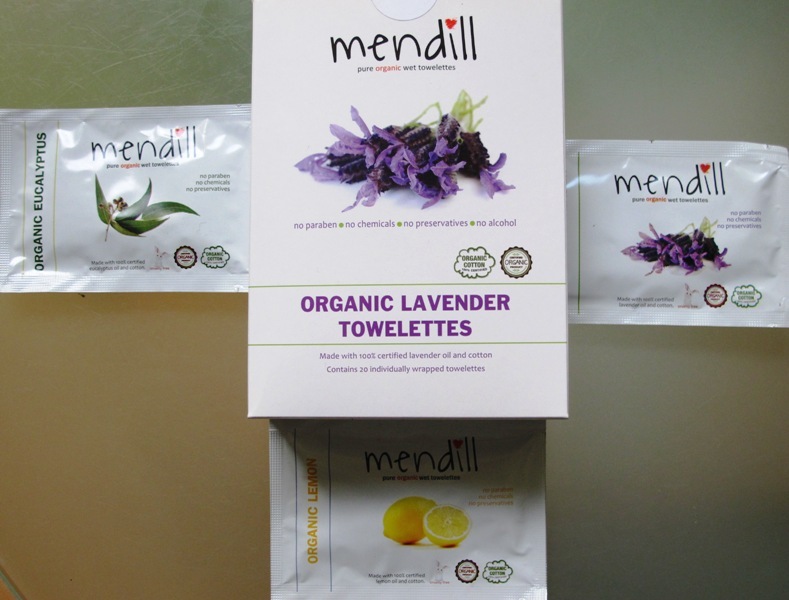 Mendill towelettes are made with pure, certified organic ingredients, are free from parabens, chemical preservatives and fragrances, including alcohol and are not tested on animals. Mendill is a member of 1% for the Planet, a growing movement of companies that donate 1% of their sales in support of environmental causes. The really clever thing about those wipes is that each one is individually wrapped ( so they won’t leak or stain the inside of your bag ) and can fit into your trouser/skirt pocket or a small evening clutch. Each sachet contains a generous, certified organic cotton towel that is infused with organic essential oil which has antiseptic and antibacterial qualities and will keep your hands protected, clean and softly scented – just make sure you don’t wipe your eyes or lips with it ! You can follow advice of Anna-Marie Solowij, a co-founder of BeautyMart who recommends using it ‘on a sore nose during colds, calming sunburnt skin, deodorising armpits ( handy if your trip doesn’t go according to plan and there is no place to take a longed for shower, so might be handy not just for mere mortals but journalists in war zones or remote areas with no access to clean running water as well ) or in the tumble-dryer to scent linen’. I sometimes wipe around my bathroom sink with them and inhale the beautiful aroma that enlivens my senses, as well as enhances the serenity of the place where I enjoy rare moments of tranquility. When it comes to kids, they love those wipes, as using them makes them feel more independent. They work well for wiping the table after a messy meal or giving a favourite toy a quick wipe. Best of all, they won’t add much bulk to your already heavy kids bag but sticking those wipes in various pockets has been known to produce squeals of delight from kids and make family travels a more pleasant experience ( and less worrying because they are handy for messy emergencies ). Mendill Wipes are available to purchase in BeautyMART retail outlets in Harvey Nichols in London & Liverpool, Box Park Shoreditch and TopShop Oxford Circus, as well as online or via LoveLula and priced £10 for 20 wipes. Choose from grapefruit, lemon, jasmine, lime, lavender, eucalyptus, mint, rosemary, tangerine. A lovely light read… I smiled to your comment ‘ furiously wiping hands many times a day’ :-)) Agreed we all need wipes and I still carry some with me, alas not with such lovely scent and less goodwill to give 1% to environmental causes. I admire that. Thank you Galina for another beautiful fun article.